Moorestown, NJ-based Barlow Tyrie, the world’s oldest manufacturer of teakwood outdoor furnishings, continues to create beautiful designs perfect for today’s outdoor living and entertaining. Varying styles encompass designs in teakwood and shade products, as well as fresh designs in stainless steel and tubular aluminum. Barlow Tyrie outdoor products are made with one of the most cherished luxuries of today’s lifestyle in mind—to truly relax and unwind. Poolside, on the patio or deck, in the garden or overlooking the dunes, Barlow Tyrie’s dedication to design and function creates a product that will enhance those times, offering good-looking, well-made and, most importantly, comfortable outdoor furnishings. High Fired” ceramic top extending table (94” closed to 142” open) which seats ten to fourteen was awarded the “Best Table” design at the 2014 International Casual Furniture and Accessories Show. The Laminam® ceramic top is fully weatherproof, being made from a product originally intended to clad buildings. 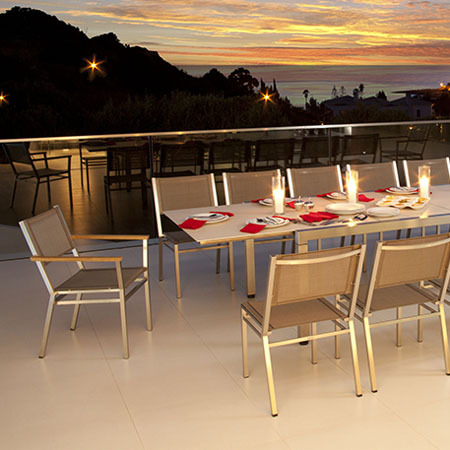 Table frame is made from durable 316 marine grade stainless steel. Available in Ash or Ivory top color. “High Fired” ceramic is an industry term meaning the porcelain ceramic has been kiln baked to over 2600 degrees Fahrenheit for exceptional rigidity. Designed by Mark Tyrie, the Monterey chair was awarded the “Best Chair” design designation at the 2014 International Casual Furniture and Accessories Show. The chair was inspired by the mid-century modern movement and features a teakwood frame and over 200 feet of all-weather woven cord made from Textilene®/Olefin® fiber making up the seat and back. 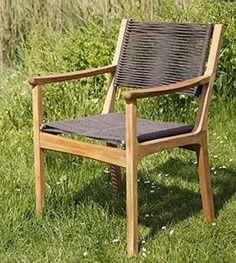 The cord is woven on a 316 grade stainless steel frame for strength which, is fitted into the chair. Designed by Mark Tyrie, the Monterey table is comprised of a “High Fired” ceramic top in “Oxide” color, a powder-coat tubular aluminum sub frame for strength and a teakwood outer frame. The table is 118” long by 39” wide. Smaller sizes will be available. Titan is designed with thick, wide top boards purposely made using teak that has visual imperfections and blemishes, such as knots, to give it a rustic “farmhouse” appeal. Introduced in 2014 as an all teak table, 2015 brings an additional offering with a black powder-coat paint finish on the table frame. This new version is available in a 94.5” length. 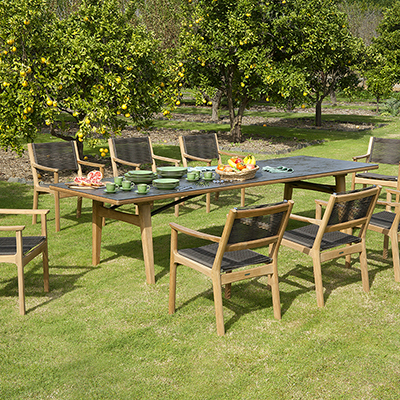 There is also a 79” matching bench which fits between the table legs and a teak and black aluminum stacking armchair. 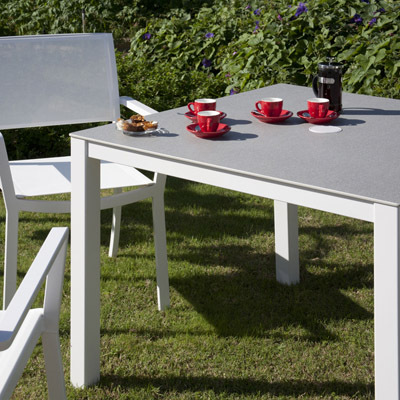 This new range of outdoor furniture features fully welded tubular aluminum framing with a durable powder-coat paint finish, beautiful ceramic table tops and Textilene ® chair slings for comfort and exceptionally low maintenance. The sun lounger features a wheel hidden in the back leg for ease of movement. Both the chairs and sun loungers stack. Dining tables are available in several sizes, 39” x 39”, 39” x 59”, 39” x 79” and a 59” circular model. All feature the hard-wearing “High Fired” porcelain ceramic table tops available in three colors, Ash, Ivory and Storm. P.T. Barlow Tyrie is located in Indonesia and processes plantation grown, sustained source teak. This is achieved by cutting the timber in the saw mill, drying (kilning) the timber and machining the wood into the hundreds of individual components from which our furnishings are then made. Barlow Tyrie controls all steps of the manufacturing process. Only the finest grade of teakwood is used. Many of the products are made in the Indonesian plant, including stainless steel and aluminum furnishings, as well as Market umbrellas and shade products. Barlow Tyrie USA is located in historic Moorestown, New Jersey. All marketing and distribution to the United States, Canada, Mexico and the Caribbean basin are managed through this location.